Shoot to kill was the order given to police by the Minister of Police Fikile Mbalula on Tuesday. Mbalula said when dealing with criminals, police should do all they can to protect themselves and the country. "I am very clear that we must be ruthless against armed criminals who kill police, there is no retreat," he said, adding however, that he didn't want police to act recklessly. "I am saying to them if they shoot you, shoot back. Shoot to kill if that is the case. Don't allow [yourselves] to be killed whilst criminals are ruthless against you. The law protects you to fight back." He urged citizens to report criminals. "We will find them, don't worry. I need your support to fight criminality." He said he would deal with police who are in the deep pockets of criminals. Mbalula said he was coming for criminals who own Ferraris which were unaccounted for. He said a new campaign Wanya Tsotsi would be aimed at targeting high level criminals. "Crime has become the biggest threat to our freedoms and rights… We have come to a conclusion that society is under siege and we must [encourage] communities to fight crime. Our harsh approach is informed by existing material conditions that compromise the safety and security of the country and its citizens." Mbalula said he meant it when pronouncing that it would be business unusual in the policing sector. He said he would be engaging with stakeholders to share a perspective and develop a common approach to fight crime. Since taking office, Mbalula formed a strategic planning session comprising of police and the civilian secretariat of the police. The planning session was convened with a view to translate its mandate into practice, he said. Mbalula said instilling fear into criminals would be the police's mantra. Mbalula intends on signing more policies which are at an advanced planning stage. These include the policy on improving the functioning of SAPS detective services, investigations into serial rapes; national integrated anti-gang strategy, and a use of force policy. He said the use of force policy meant that police would meet fire with fire. "We will shoot to defend the innocent, we will shoot to defend the law, we will shoot to defend ourselves and make sure that criminals do not reign." 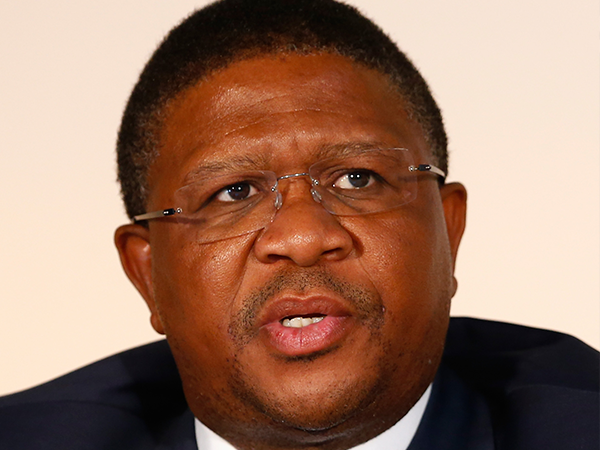 Mbalula said under-reported crimes are domestic and sexual violence. He said a policy in removing barriers has been developed to curb under-reporting of these crimes. He said following recommendations by the commission of inquiry after the Marikana massacre, demilitarization of police was identified as one of the priorities. He added that 57% of police members were in administrative positions and this would need to change. "It is my intention to move swiftly in the shifting of administrative responsibilities from SAPS."